In case you have not noticed, the world did not end. The Mayans were not wrong; the interpretation was. Nor did we plummet off of the fiscal cliff. However you look at it we are still here and 2013 heralds a new chapter. If you are one of our beloved readers, in this next phase we pledge to bring you more thought-provoking and design-right visions and reports. This year kicks off with bold patterns, new technology, eclectic interiors, small suites with big impact, sustainable products, and special attention paid to the details. Get inspired with the January edition! 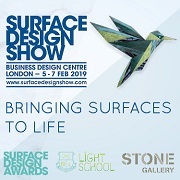 We attend over 100 design events a year on your behalf to bring you trend insights and design movements to help you maintain cutting-edge knowledge of the lifestyle and design markets. Currently we keep readers within 171 countries/territories in the know! Are you reading Trendease.com? Frankfurt — In this issue we look at material research, product development, and technological advances. Other features in this edition return to the more traditional aspect of design: bold color in motifs, eclectic pattern combinations, interior design in tight quarters, a look at some unique detailing in furniture manufacture, and a review of sustainable product designs. Also, a couple of previews unveil some novelties to discover at key upcoming trade shows. London — Carole Collet unveiled one of the most provocative projects we have seen recently. What if plants were the secret to sustainable textile manufacturing? Collet’s research into the field of what she calls “biofacture” fuses plant architecture, biological morphogenesis, and synthetic biology to look at the potential of genetically controlling plants to program them to grow products. Worldwide — First we saw the return of color; now comes the patterned punch! At trade shows across Europe the Trendease Team has witnessed the resurgence of patterns. International flare meets eco-friendly design and technology in this gallery chock full of patterned punch. The designs take us around the world and through a variety of product categories. Worldwide — Think McDonalds with a twist – all of those menu items to choose from to create the special combo meal you want. Contemporary designers have taken a similar approach, an a la carte menu of inspiration cherry picked to bring multiple things together in one, to create items fit for the consumers’ wants and needs. London — How would you design a five star luxury hotel guestroom that was only 23 square meters in size? In this feature five creative firms will show how size doesn’t matter; it is how you use what you have got to make something marvelous. They were given the walls, floors, and doors; the rest was up to the interior designers and architects. Paris — The winter trade show rush is upon us and quite a few of you will be journeying to Paris for some of the events. There is a fresh place in town to whet your appetite for the new and eccentric. Alfred Bernardin and his team have designed and decorated this breakfast, lunch, tapas, and cocktail hotspot with an eclectic mix of styles and vintage pieces sourced from around the world. Worldwide — Designers create stuff. They make a living by envisioning new products. So doesn’t the idea of developing products that are more durable self-sacrificing? With umpteen items out in the world that need to be rethought and redesigned, in addition to a myriad of problems that have yet to have designs created to solve them, there will still be a plethora of opportunities for all creatives with good sense and the noble goal of manufacturing sustainable goods. 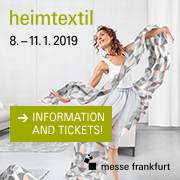 Frankfurt — This is day one of Heimtextil, and this week we bring you the newsletter early so you can be some of the first to see the amazing trend forum! In this gallery see the fashionable and lava hot entrance to this year’s trends presented in the Messe Frankfurt Forum. From apparel to color stories that literally make heads spin, to textiles made of needles and stools that look like they came straight from the scorching core of the earth. All four trend themes too! Frankfurt — The historian is a treasurer of the past, seeking value and discovering ways to make history relevant to contemporary life. The historian is partial to noble products of supreme craft and artisanship with aristocratic élam. The color palette is muted by the absence of bright light. Day light shimmers through to reveal pearlescent pales, candlelit metallic sheen and dim and mysterious dark shades. Frankfurt — The eccentric is a hunter and collector, chasing the exquisite and the unique, cherishing and mixing discoveries with darling eclecticism. The eccentric assembles flamboyant concepts that have a timeless quality and an extremely decorative character. The color palette is a range that stages the abundant as well as the understated to enable the flamboyant color clashes where extravagance meets elegance and exoticism. Frankfurt — The inventor is an intelligent free thinker, experimenting and researching solutions to make life fulfilling, fun and exciting. The inventor is fond of concepts in which function meets fun, wellness and entertainment, eager to leave a personal trace on designs. The color palette is a playful range of vivid shades. The intrigue is drawn by the strong contrasts, combining the clinical with the organic, the hat with the frozen and sparkling understated functionality with a healthy dose of amusement. Frankfurt — The geologist is a nature lover, preserving as well as exploring the deepest layers of the earth and digging down for the unseen and the unexpected. The geologist values the precious imperfections of the geological textures, the science of nature and its surreal quality. The color range reflects the mysterious, dark side of nature. Intense hues are sparked with poisonous brightness and metallic sheen to light up our urban caves. Irregular surface effects breathe life into dense and understated natural shades. Birmingham — There are new podcasts for the audio, and now this newsletter for the visual. Experience a sneak peek of almost 100 products created by the talents that will showcase their wares in the Designersblock & Co. department store at Interiors UK kicking off this Sunday; view some pre-show excitement here! Paris — In case you missed it, Elizabeth Leriche, in addition to her trend stop on the Maison&Objet inspiration trail, curated a trend space with items from 50 artisans belonging to Ateliers d’Art de France titled “Wondernature”. The four mini houses—Nourishing Nature, Tamed Nature, Enchanted Nature, and Immersed Nature—are in tune with current societal shifts. Subscribers can tour these structures and the products within them here.